“And for that you get a kiss.” That’s what President Barack Obama said to me right before pecking me on the cheek. And that is how the night got started on St. Patrick’s Day at the White House. 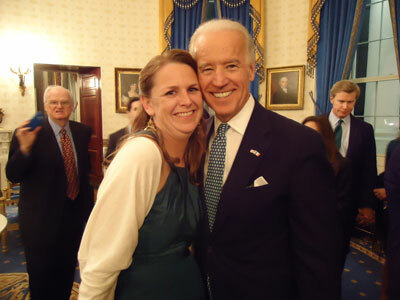 The President didn’t kiss me because I’m Irish, nor because my sister Anne was celebrating her birthday, which earned her a gracious hug from the First Lady. But President Obama’s Irish roots were evident in the warm welcome we received, making my first visit to the White House an unforgettable evening. My family was thrilled and honored to be invited to the annual Celebration of Ireland at the White House, a St Patrick’s Day tradition. Thanks mostly to my dad Jim Cavanaugh, I was lucky to join his wife Leslie, my sister, Anne, and my husband Peter Coffey for the party in the East Wing joined by a few hundred other revelers. Guests were greeted outside the east entrance with a performance by the U.S. Air Force Reserve Pipe Band. Nothing says St. Patrick’s Day like bag pipes, drums and men in kilts, except maybe a nice cup of spirits, with which I was met the moment I entered the East Wing. And the generosity of food and drink continued on until the very end. Upstairs in the ornate State Dining Room there was a lovely spread of Irish inspired eats, including smoked duck breast with cabbage, pheasant ravioli and chocolate whiskey cake. And on hand to eat, drink and be merry — in addition to the President and First Lady — were the Prime Minister of Ireland Enda Kenny and his wife, Vice President Joe Biden, Senators, Congressmen, a handful of Governors, two Cabinet members and at least three Kennedys by our informal count. Where else are you going to have a fun conversation with the Secretary of Health and Human Services about Irish cuisine without the interruption of security or a schedule that keeps them from letting down their hair? After getting over the initial shock that I am a guest at the President’s house comes the euphoria that I can stroll through the rooms, taking in unrestricted access to all of their beautiful American treasures. Surrounded by men and women in uniform as well as VIPs from Washington and Dublin, you can’t help but be in awe of the fact that you are actually in the White House. The portraits hanging on the walls tell the tale of the history of this iconic American building, and the men and women who have made it their home. While the Obamas took their leave after a few words and the ceremonial presentation of the shamrock, the Vice President stayed on to talk to guests and pose for pictures. He was the model of Irish hospitality, giving Anne an excited congratulations and an embrace before posing for a picture with her after finding out it was her birthday. As to the kiss I received from the President, what made me worthy of such a special gift? Quite simply, my husband. Obama has known Peter since before his successful run for the U.S. Senate in Illinois. So when I introduced myself to the President as Peter’s wife, it was for that I got a kiss. Who would have guessed that being married to an Irishman from Chicago could get such a reaction? To say I owe my husband is an understatement. To think that he’ll ever let me forget, well then you just learned a little something about the Irish.